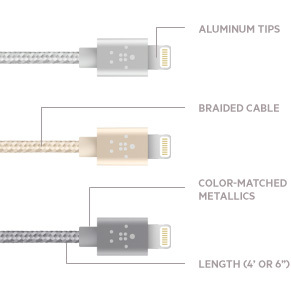 MIXIT↑™ Metallic Colormatch Charge Kit + Cable is rated 3.5 out of 5 by 6. The ultimate all-in-one charging collection for your iPhone with a Lightning cable, home charger, car charger and a mobile battery pack. Whether you’re at home, in the car or on the go, you’ll never be without power. Perfectly prepared to sync to any location, the ColorMatch Charge Kit will also perfectly sync with your iPhone in four stunning metallic finishes: gold, silver, space gray or hot rose gold. When it comes to powering up your iPhone in style, the Color Match Charge Kit has got your back. Rated 1 out of 5 by Hugovanvliet from It doesn't work at all I bought it yesterday and it does not charge at all. Rated 4 out of 5 by Keno from Nice kit! Bought this to charge my Apple devices. Everything works but I wasn’t sure how this all works together - there is no technical documentation. No problems. Rated 1 out of 5 by Lizz from Does not work I bought this as a great backup for my Greece vacation to my surprise when I plugged it into my phone it did not work. I was extremely disappointed and annoyed that my phone kept dying and was unable to capture every moment. Rated 5 out of 5 by Mappquest from Does exactly as I hoped and expected I bought this a few weeks ago since I was looking at a external battery pack and a car charger. This seemed like the best fit. The cable feels great. The wall adapter charges at the same rate as the the Apple branded iPad wall adapters. The car charger is small but effective. And the external battery is great, holds a charge, and can charge my devices numerous times. No complaints. Everything feels great and looks great. Not a single regret at all. Great for anyone looking for two or more of what's offered in the box, or a great gift for birthdays or holidays!